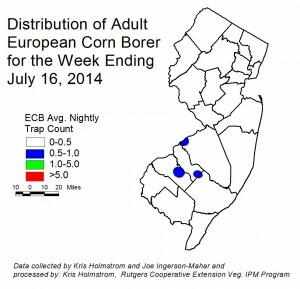 European Corn Borer (ECB) adult catches remain very low, as we are between flights. At this time, very limited catches are occurring mainly in southwestern parts of the state (see ECB map). Larval infestations in sweet corn have peaked in corn plantings, and plants now in whorl and pre-tassel stages are largely free of ECB damage. As plants mature to pre-tassel, live larvae and droppings can be observed in the tassels. Consider treating if 12% or more plants exhibit ECB feeding alone, or in combination with FAW (see below) injury. Remember to make a full-tassel application to control ECB larvae as they leave the tassel and travel down the stalk to re-enter the plant near the ear shank. This last application is often critical to controlling ear infestations from ECB. Blacklight Trap Corn Earworm Moth (CEW): Corn earworm moths (CEW) catches have intensified slightly in blacklight traps in the southwestern part of the state. Overall, catches are moderately low, and no catches have occurred north of southern Burlington County. It is possible that this weeks’ weather will have assisted some CEW migration into this area, but we would expect gradual increases in adults now until the major migratory push that typically comes in August. Pheromone Trap Corn Earworm Moth (CEW): Catches are increasing, with higher catches uniformly occurring across southern counties (see CEW pheromone trap map). The green area on the map roughly corresponds to a 4-day silk spray schedule. Low spots within the broader green area should be considered outliers, and grower near those areas should defer to the more conservative schedule. Blacklight and pheromone traps match in terms of where most moth activity is occurring. Highest activity is along the Delaware Bay shore. Sweet corn plantings now in silk in southern NJ are at risk for ear infestation if CEW is not properly controlled. As silks begin to appear, pay close attention to CEW catches in local blacklight traps, and treat silking plantings accordingly. Fall armyworm (FAW) infestations have been increasing steadily, particularly in coastal areas. Whorl stage infestations above 20% have been found from Cape May northward through coastal Monmouth County. FAW caterpillars consume corn foliage, and produce large quantities of feces that pile up within the whorl. FAW larvae typically have light and dark brown bands, and the head capsule has a distinctive upside-down “Y” pattern on it. Unlike ECB, FAW will feed on corn plantings in the seedling stage, although whorl stage is usually the first to be affected. Consider treating if the number of plants infested with FAW either alone, or in combination with ECB exceeds 12%. FAW may be difficult to control with pyrethroid insecticides. Newer materials, including spinosad-based insecticides, as well as those including active ingredients chlorantraniliprole and flubendiamide are effective against BAW. Pepper plantings are developing two spotted spider mite (TSSM) infestations in many areas. With warm, humid conditions TSSM can build to high populations rapidly. The use of pyrethroid insecticides for worm control may encourage the development and severity of TSSM problems in peppers. Infestations will be most easily detected by the whitish “pin-spot” or stipple that appears on the upper leaf surface as TSSM feed below. TSSM infestations may develop near other favored hosts like watermelon and eggplant, or near field edges as bordering vegetation dries up or is mowed. Many effective miticides are available. See the 2014 Commercial Vegetable Production Recommendations for materials useful in controlling TSSM. If caterpillar pests warrant control, consider an insecticide that is not destructive to predators and parasites of aphids and TSSM. These include Coragen and Belt (or Synapse). 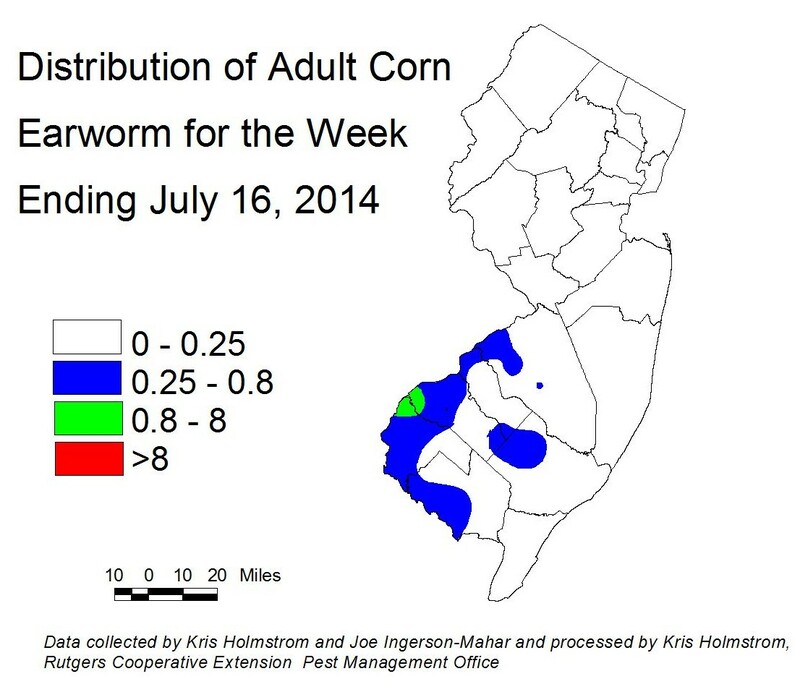 Beet armyworm (BAW) have been found in Cape May County, but numbers remain quite low. As pepper infestations occur, information will follow. Pepper weevil counts in the traps remain at zero. It is hoped that there are no infested fields at this point and if so, we may not have late season infestations. Obviously we currently have a lower population of weevils than in 2013. Field scouts are beginning to see native brown stinkbugs in a number of crops. Early July is typically the time of summer when adults become active in host crops, and damage may be expected. Native species have a distinct preference for tomatoes. Typically this injury increases with drier weather. Be sure to monitor fruit for this damage (known as cloudy spot). If cloudy spot is increasing in harvested fruit, consider an insecticide application to limit further damage. Consult the 2014 Commercial Vegetable Production Recommendations for specific insecticide recommendations. Tomato hornworms (THW) are now appearing in tomato plantings, and in higher levels inside high tunnels. These large caterpillars are difficult to find, but can cause extensive injury on individual plants. Typically, THW injury does not rise to economic levels in the field, as the number of damaged plants is relatively few. In high tunnels, though, control may be warranted. Plants with leaves completely stripped of leaflets, partially consumed green fruit and large droppings on the floor are all signs of THW feeding. Consult the 2014 Commercial Vegetable Production Recommendations for specific insecticide recommendations. BMSB activity has increased slightly, but catches remain quite low overall in blacklight traps. Adult activity continues to be well behind in 2014. As adult captures increase to 5/night for a full week, maps will be produced to show where activity is highest. Information on scouting, crop injury and control will also be included. These crops are beginning to run in many areas. 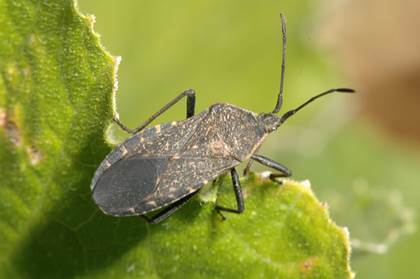 Squash bugs are, or will soon be appearing in plantings. These large true bugs look somewhat like elongated brown stinkbugs (see photo), and will lay copper colored eggs on upper and lower surfaces of leaves. Newly hatched nymphs are spider-like in appearance, and tend to cluster in groups for several days. As the nymphs grow, they change from green and black to dusty gray in color. These bugs generally do not cause economic injury in vigorous plants, and control is not warranted at this time. As crops mature (particularly in U-pick fields) it may be necessary to eliminate them, as they may deter customers from entering fields. It is important to limit the use of broad spectrum insecticides at this time, as bees are actively pollenating flowers. As fruit begin to appear and enlarge, the appearance of powdery mildew (PM) will follow. Until PM lesions develop, there is no need for fungicides targeting that pathogen. Check upper and lower surfaces of 2 mature leaves per plant on 5 consecutive plants each, in 10 locations throughout the field. When PM lesions are found on 2 or more leaves, begin a weekly protectant fungicide program. See the 2014 Commercial Vegetable Production Recommendations for materials useful in managing PM.